To add custom fields you must have the "Custom Fields" addon. This is a list of fields group: https://docs.wpusermanager.com/article/40-field-groups. Select a group to display the list of fields within that group, once you've selected a group you can add new fields. In the newly opened window, click on the "Add custom field" button. Then type the name of the field and select the type of field you wish to create. Each section contains the fields types that you can add. 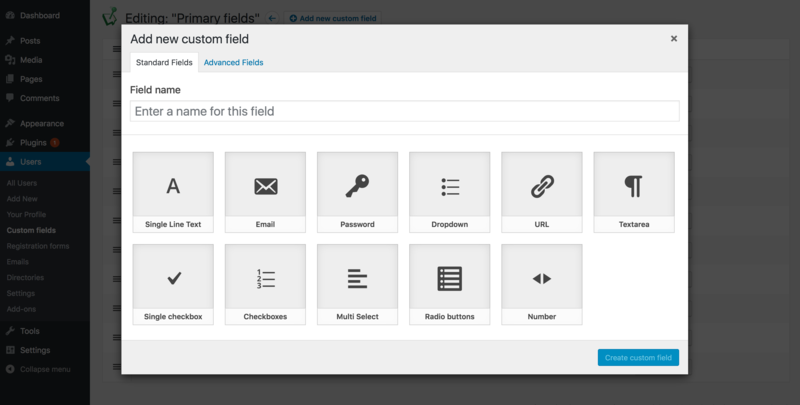 Once the field is created and you'll be displayed a new modal window, where you can customize name, description, requirements and other settings. Each field has it's own settings.